The restaurant business can be a risky one. Aside from the huge personal risk that comes with opening your own restaurant, even when you have been in business for many years, you are still not out of the woods yet. From fires and kitchen accidents to dirty bathrooms and slip and falls, restaurants can be dangerous territory. Are you aware of these 5 top risks to restaurants? After all, awareness is the first step to prevent accidents from occurring. Let’s take a look at some common risks. 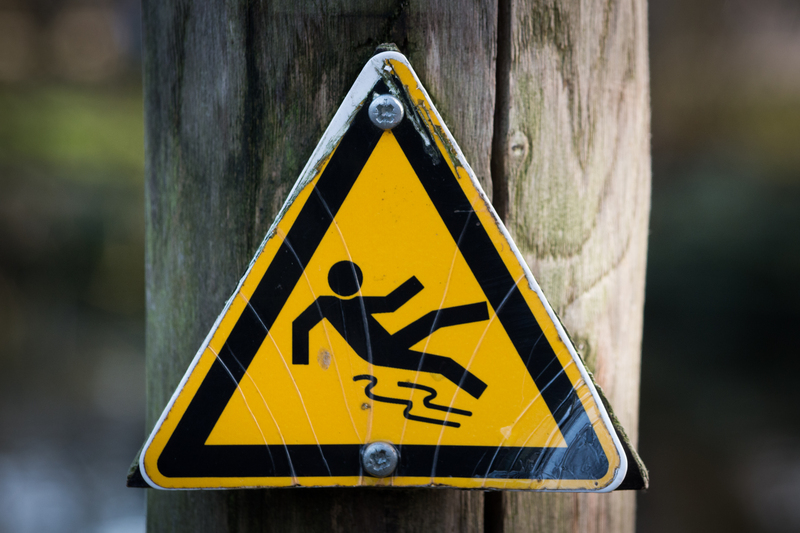 Slip and falls are such common, yet preventable, accidents. In fact, slip and falls are the number one cause of accidents in restaurants and other public buildings, according to National Floor Safety Institute. Your employees are perhaps most of all at risk. The best way to prevent these sticky situations is to keep all areas clean at all times. When liquids or spills of any kind happen in the kitchen, make sure they are promptly cleaned up. Use caution signs out on the restaurant floor as well as on the back end to alert employees and patrons of any slippery areas. You can also implement a training program for employees to learn about protection and ongoing maintenance of floors. In this case, prevention is key. Your food and service could be spot on, but if your restroom is unclean customers find it as a total deal breaker. This scenario is inexcusable. Make sure you are taking proper care of the bathrooms for your customers and employees. Hire a cleaning service if needed. Don’t overlook this aspect of your business, and make a good impression in order to maximize the success of your restaurant. Where there’s smoke, there’s oftentimes fire. Kitchen fires are all too common in the restaurant business. Nearly 8,000 restaurants report a fire each year, according to data from the National Fire Protection Association. Needless to say, a fire can devastate your business. Don’t risk losing lives or your restaurant and make sure you take every precaution when it comes to fire safety. While it’s true some fires may be unavoidable, there are steps you can take to greatly reduce your risk. Clean all surfaces and hood ranges, have exhaust systems inspected and do not let grease build up. You can also speak with your local fire department for extra safety tips. Have fire extinguishers readily available and be sure to check that all smoke alarms and detectors are up to code and regularly tested. Train your employees on fire safety measures and hold drills as well so everyone is prepared in the event of an emergency. While you are closed overnight, beware of break-ins. Many restaurants have large windows or doors that could attract potential burglars and intruders. Mitigate your risk of experiencing a break-in by installing a security system with cameras and alarms. Always fix broken doors and locks on windows to ensure your restaurant’s security. Consider setting up a code for your alarm system and do not share it with more than one or two trusted employees. When you’re working around hot apparatuses and sharp knives, injuries are commonplace. Your chefs and line cooks are at risk of some serious kitchen injuries. Keep first aid kits on hand and educate employees on knife and kitchen safety. Always prioritize safety in your restaurant’s kitchen to prevent mishandling and accidents. Have you considered getting insurance coverage for your restaurant? Restaurant Programs of America is a full-service insurance agency focused exclusively on the restaurant industry. Please contact us at 866-577-7007 for more information.